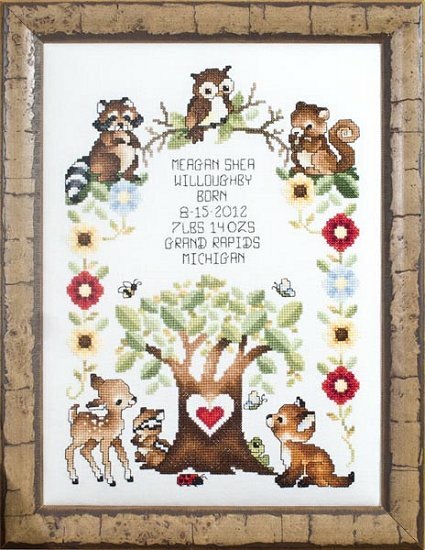 The bulk of my crafting time this month went towards baby O's Woodland birth sampler. I started at center and worked on the bottom right quadrant. The right half of the tree is just about complete and I started working on the fox, unfortunately not quite discernable at this stage. I'll probably keep this on the scroll bars til I finish the quadrant. The top half of the sampler should be completed more quickly since that is where all the personalization will be with less charted cross stitches. I also found a bit of time in my sewing room, actually with Ollie in the ergo carrier. Turns out sewing with baby in Ergo is easier than sewing with big preggo belly. And he seems to find the noises of the sewing machine soothing! I guess it is familiar, I spent an awful lot of time sewing when he was utero. Anyway, I completed a nursery project- countoured changing pad covers. A Load of Craft has a great tutorial. I drew the pattern and sewed up one the night before he was born (literally, I finished the project and went into labor an hour later!) That night, I also cut out the second, which I sewed up recently. I skipped the elastic at the end because the cover is well fitted without it. The material is Minky dot that I got on sale, plus used a coupon at Joann. If you can get that sort of deal, this project is super economical! I use a waterproof liner on top of my changing pad cover, so it doesn't get terribly dirty. But still, having two of everything is sort of critical with a baby. Happy St. Patrick's Day! Here are my home dec projects. Last year I made the Lucky blocks (gold glitter paint on craft store wood letters) and the floral arrangement. The Irish blessing sign, key, and little Leprechaun statue are craft store purchases. I also crafted the shamrock bunting for my living/dining space last year. I found a shamrock template online and used it to cut out the motif in two sizes from two different colors of stiff felt, punched a hole in each corner, ran ribbon through and sewed the ribbon loops to a striped ribbon. This year I made a wreath for the front door. It felt great hacking up the foliage and weilding the glue gun- I don't exactly get a lot of time in my craft room these days. Grapevine wreath with a some sparkly shamrock foliage, a few green blooms, light green ferns, plus a few embellishments (butterflies and leprechaun), and a six loop bow. I picked up all the materials a few days before St. Patrick's Day, so everything was deeply discounted and this wreath cost less than $10 to make! Sadly, my verdant wreath is somewhat of a joke because this is the view out my back window on the seventeenth of March, just a few days before the Spring Equinox. For the record, I live in the Mid-Atlantic, not the Arctic. We have been clobbered by snow this year and another 7" this late in the season feels like an insult. I am ready for some warmth! As of the end of January, I'd say progress is near 50%. Time to start a new Mira, perhaps? At the beginning of February, I started a new project, Lizzie Kate Christmas by the letter, on 32 count raw linen by MCG Textiles. I guess quality is hit or miss with this fabric brand, I've used it before and it was fine, though I'm not thrilled witt the quality of this piece. However, the price was right- just a few dollars at Joann. In another concession to economy, I'm using some of the hand dyed threads as charted, also some plain DMC. Progress is around 15%, as of February 7th or so. I tried working on it in the next few days before I went into labor on the 10th, but my comfy stitching chair was not so comfy anymore. Since his arrival, I've put in a few stitches, but nothing significant. I also worked in a few nursery decor projects. First, lined back tab drapes. View Along the Way has a great tutorial. Same fabric (Joann Fabric mid weight cotton "Monkey Stripe") for a "cheater" box pleated crib skirt, per Teal and Lime. The panels are merely taped to bed frame underneath mattress so the length will be adjustable. We will lower the mattress as baby O grows. These pics reveal glimpses of Ollie's nursery. Eventually, I will post a full reveal, but it may be a while until I finish all the projects. I'll set a loose deadline- say when he is 6 months old (mid August). For the next full moon, which is not so far away, I would like to work on additional nursery decor projects, like the baby quilt I have pieced and sandwiched. I would also like to make a start on Ollie's birth sampler. It's a fairly small patten by Stoney Creek but involves many colors .